If you love the appearance of a timber door, but appreciate the benefits of modern materials, then a composite door is a must for your home. A rigid foam core is sealed inside a moulded skin of durable and impermeable glass–reinforced plastic. The result: a door that’s as tough as old boots but which has all the elegance and style that your home deserves. Composite doors are perfect for the British weather. When it rains, they won’t swell and stick. When it’s dry, they won’t shrink and let the draughts whistle around your hallway. They are built with insulating materials and, set in Optima’s sculptured frames, can provide outstanding thermal performance and protect you from the disturbance of external noise. Every product has the power of Yale hardware built in, which means your new Composite doors come with the added reassurance of the Yale Lifetime Guarantee. There’s an almost endless variety of styles – something to suit every home, whether it’s traditional or modern, large or small. Choose from solid colours or attractive wood – effect finishes, all of which are permanently imprinted with the grain and texture of natural wood. 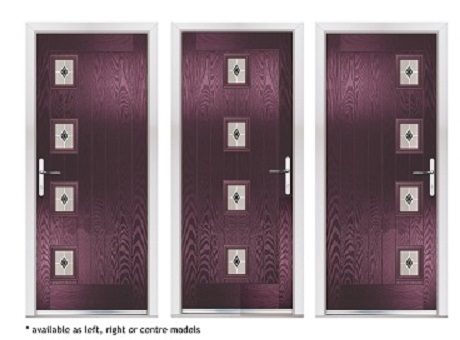 Equally Suitable for the front or rear entrances, composite doors can make coming home a real joy.